The concept of “Modernism” in 20th century Indian architectural development remains difficult to grasp, as it was used within numerous stylistic developments, following the spirit of the day. Starting with the efforts made by Europeans in the 1920s, the idea of “modern architecture” as a revolutionary and innovative force started to make cautious headway in India in the early 1930s. But at that time any Western thought and practice introduced as a British import was seen as “modern”, as India had no uniform independent architectural movement in the early 20th century. Ideas influenced by the Bauhaus and Le Corbusier and then brought to India were modern, and the subsequent Art Deco movement, influenced by both regional and exotic motifs, also counted as modern. Even neoclassical architecture was still pronounced modern into the 1950s and even the 1960s. But Modernism in India was more like an overall approach to life. It meant designing the world positively, improving it, doing better than the required standard, being progressive and inventive, and this certainly included great visionary minds like Tagore and Nehru. British architects in India felt themselves to be modern, because they could work within an experimental field, almost without constraints and regulations, with an unusual degree of freedom. These various trends will now be discussed in a little more detail. One consequence of the consolidation of British colonial power in the 19th century was that public buildings in particular became the centre of interest. Great educational institutions like Bombay University in 1870 or stations as gateways to the world, like Victoria Station in the former Bombay in 1887, or also important monuments like the Victoria Memorial in Calcutta in 1906, were prestigious structures by a self-confident class of British architects who wanted to demonstrate the superiority of European culture. This was particularly evident when the seat of government moved from Calcutta to Delhi and in 1912 Edwin Lutyens and Herbert Baker were commissioned to realise the government buildings in “New Delhi.” The architects designed a monumental urban street complex that was essentially alien to Indian cities, with a grandiose geometry of axes and avenues and above all two symmetrical administrative buildings flanking the view of the viceroy’s palace. Lavish colonnades, open verandas, tall, slender windows, chhajjas (wide roof overhangs) and cornices jaalis (circular stone apertures) and chhatris (free-standing pavilions) were used at the same time as decorative elements from typical historic Indian architecture. The viceroy’s palace has a dome reminiscent of the Buddhist stupa in Sanchi. Even though Lutyens and Baker fused classical European and Indian elements, the complex seems modern for its day, with its two-dimensional walls, reticent décor and austere geometry in the case of the palace in particular. The seat of government was not opened until 1931, after a building period of almost 20 years. The main neoclassical period lasted well beyond the 1930s, above all because of the influence of the Indian Institute of Architects which existed since the 1920s, a British institution first headed by a Briton, Claude Batley. His theories were based on studies of Graeco-Roman, but also of Indian, classicism. His enormous influence led to the foundation of the conservative school, whose major exponents included Sudlow-Ballardie- Thompson, for example, and Ganesh Deolalikar, who worked up until the 1950s. His Supreme Court in New Delhi imitated the Lutyens-Baker buildings down to the last detail. The conservative, so-called revivalists also included B.R. Manickam with his monumental historical Vidhana Soudha government building in Bangalore built in 1952, reminiscent of Indian palace complexes. Colossal columns, Mogul domes, symmetry and monumental mass were evidence that historical European-Indian forms were being retained. But a new thinking had long since taken hold, based on the reduced formal language of the “international style,” but also attached to European abstract Expressionism, as can be seen in Arthur G. Shoesmith’s St. Martin’s Garrison Church in New Delhi of 1931, whose volumes loom like pure prisms of solid mass thrusting into one another. De Stijl, the important Dutch movement that ran parallel with the Bauhaus, had very little influence on India, however, even though Willem Marinus Dudok did realise some buildings there. 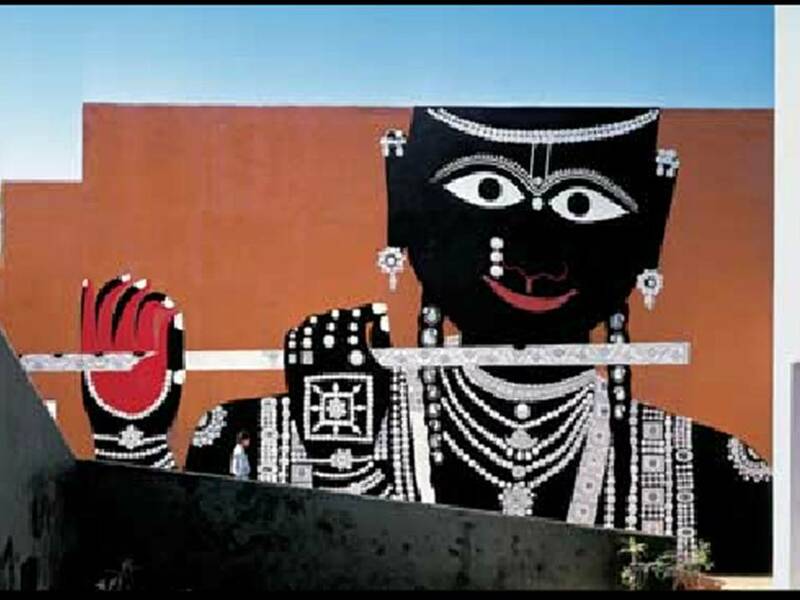 In the early 1940s the austerity of what was later called classical Modernism started to be mixed with Expressionism and with decorative motifs, and above all fluent lines, often curved, markedly horizontal and vertical: the highly influential Art Deco movement, which spread over the whole of India, made a triumphant entry into the world of Indian architecture. France, but particularly America, stood model for this movement, whose architects raised Art Deco to an art form of great virtuosity. “Streamlined architecture,” as Art Deco was also known, developed its distinctive form partly from the technical achievements of its day, the rounded shapes of aircraft and cars. Then Frank Lloyd Wright discovered the decorative world of the Mexicans and of the Aztecs and Mayans. Their essentially geometrical motifs, along with associated devices like palms, aircraft and sunbeams, finally made their international début on the Art Deco stage. Indian Art Deco was also increasingly mixed with regional applications, leading to some lavishly decorated façades. In an age without television, architects were particularly fond of the generally popular cinema buildings, where they could create Art Deco designs with a monumental gesture. Many of these picture palaces have survived to the present day, providing evidence of a great architectural phase. At the time of independence in 1947, India had only about 300 trained architects in a population of what was then 330 million, and only one training institution, the Indian Institute of Architects in Bombay. Those who could afford it studied abroad, preferably in the USA, as some Modernist heroes, especially from the Bauhaus, like Mies van der Rohe, Walter Gropius and Marcel Breuer had emigrated to America from Fascist Germany. The first generation of Indian architects came back from America with a new optimism, free of the British influence at the Bombay school, euphoric and able to offer their urgently needed services to a free country. One of them was Habib Rahman, who studied under Gropius at the MIT in Boston, another Achyut Kanvinde from Harvard and Gautam Sarabhai, who worked with Wright in Taliesin. Thus the influence of the Bauhaus masters came to India for a second time, this time directly via their pupils, whose somewhat over-functionalistic interpretations were realised by Kanvinde in particular. But at the same time a new concrete Expressionism was developing in South America, in the work of for example Felix Candela or Oskar Niemeyer, based on the technical possibility of being able to bridge large spans. These impressive constructions stimulated young Indian architects to endow the rigid rationalism of the German teachers in America with fluent form. One of the most important pupils returning from the MIT in Cambridge/Boston in the 1950s was Charles Correa. He had worked under Minoru Yamasaki in Detroit, who later designed the World Trade Center in New York. Correa came back to India in 1958, at a time when the most important architect of the first half of the 20th century, Le Corbusier, had already realised his life’s greatest project in India. Le Corbusier was invited by Nehru in person in the early 1950s and built Chandigarh, the new capital of the state of Punjab. Le Corbusier’s visionary powers, which he proved in urban developments from the 1920s onwards, seemed to be precisely the right person to Nehru, who said that India needed “a slap in the face.” Working with his cousin Pierre Jeanneret and the architects Jane Drew and Maxwell Fry, Le Corbusier realised the entire urban structure, designing himself the government building, the Capitol. His béton brut, the unrendered surfaces of the buildings, still showing the marks of the rough shuttering, and the expressive and sculptural effect made by solitaire monuments spread over a large area, came as something of a shock to the Indian architects, who had found a new hero for themselves from now on. Le Corbusier’s messages became the new gospel for the next generation, who recognised a new intellectual dimension in them. Le Corbusier was commissioned to build more villas and a museum in . Here he had an Indian at his side who had already worked for him in Paris, Balkrishna Vitaldhas Doshi. It was Doshi who in the early 1960s got in touch with Louis I. Kahn in order to develop the Indian Institute of Management in Ahmedabad. Kahn was impressed by the offer and realised the project during a period of over 13 years. Kahn was the next significant architect for India: his structures built on pure geometry to illustrate inherent order, his turn to a pictorial language for architecture that went beyond functionalism and the use of rough brick for the façade in order to express the nature of the material, added yet another dimension to Indian architects’ experience. Charles Correa developed his work when these two towering 20th century masters were both building in India. 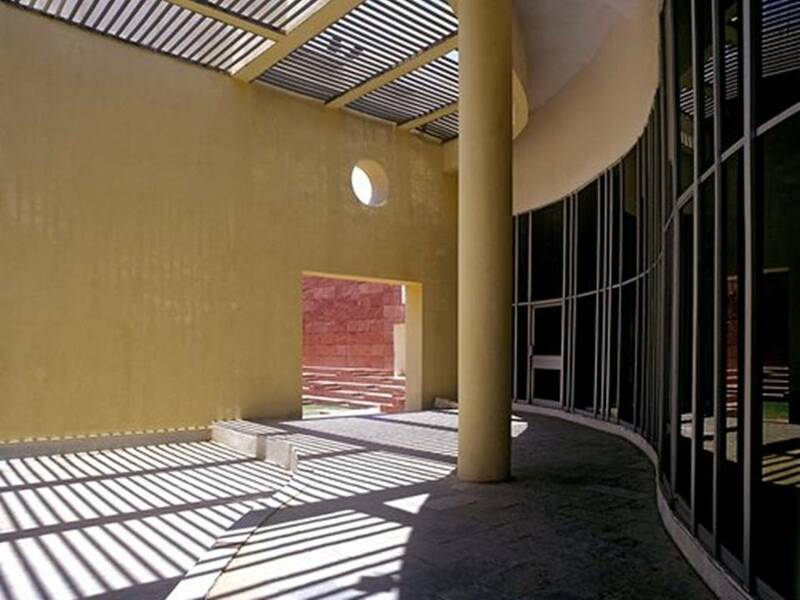 His 1963 memorial for Mahatma Gandhi in Ahmedabad, which is reminiscent of Kahn’s design for the Trenton Bath House, marks the beginning of his mature work. The most important buildings after that were his Kanchanjunga high-rise apartments in Mumbai, built from 1970 –1983, then the government building in Bhopal, 1980 – 1996 (see p. 26 – 93), and the art centre in Jaipur, 1986 – 1992 where he discovered the spiritual dimension of Indian thought and integrated it into his work. 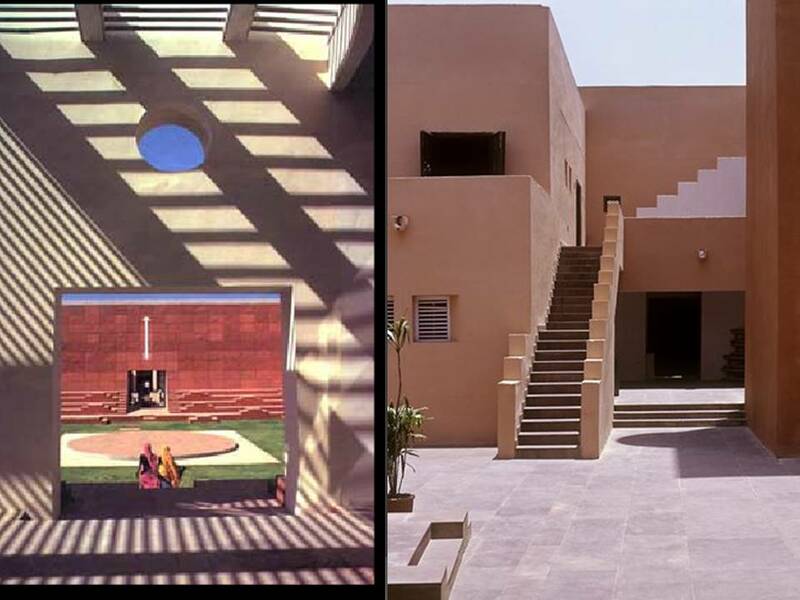 Correa is the most important representative of his generation and still India’s most significant contemporary architect. Alongside Doshi and Correa, Anant Raje is another major architect of this generation. 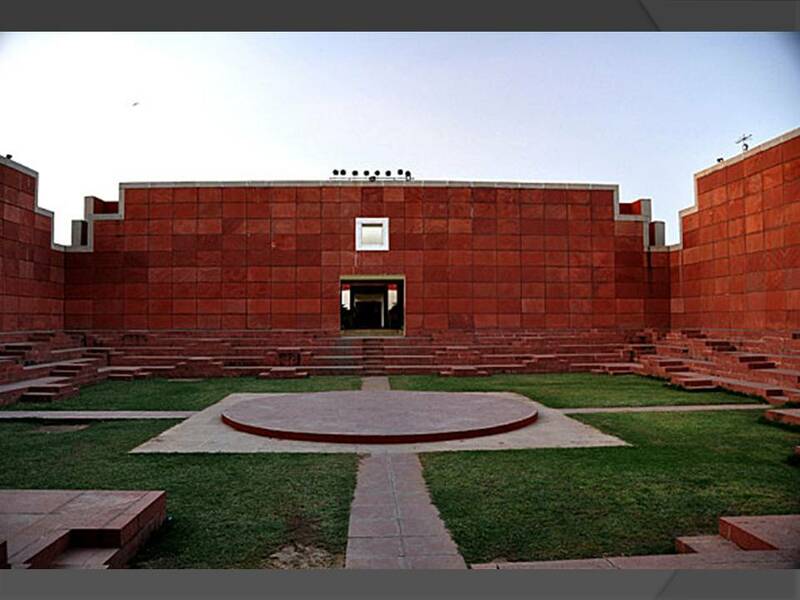 Raje realised the Indian Institute buildings as Kahn’s right hand and added others in the spirit of Kahn. 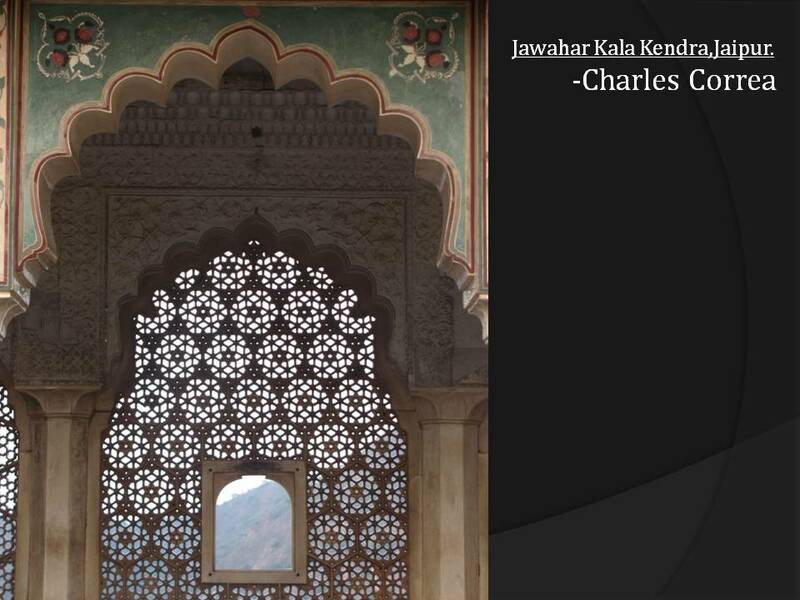 His work is clearly shaped by Kahn’s structures, but he interpreted them independently. Raj Rewal also belongs in this group. 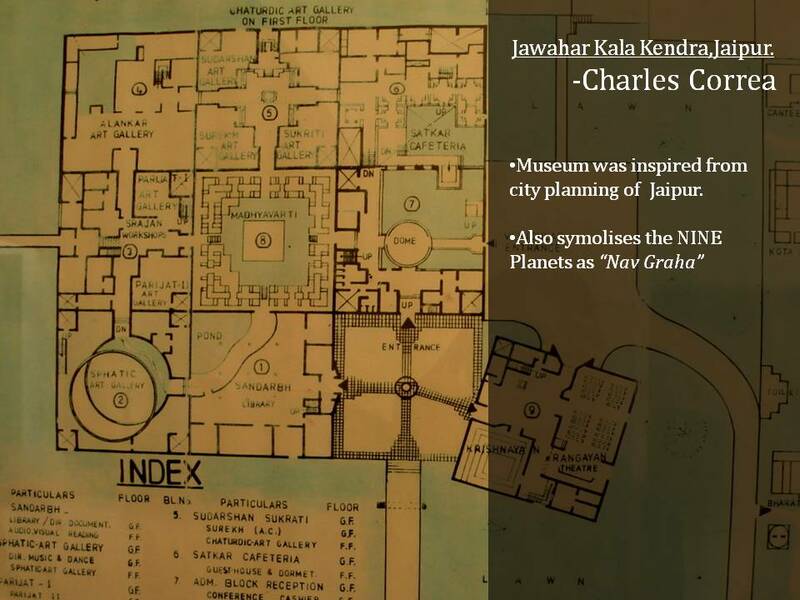 Educated in Delhi and London, he was influenced at an early stage by the Japanese Metabolists, but later found his own identity in India’s history, pursuing the concept of a Modernism based on tradition. His parliament library (see p. 42 – 49) is one of the outstanding Indian building projects of the last ten years. The selection of architects from the younger generation introduced here does not claim to be complete or comprehensive within the limited scope of a publication of this kind. Architects who are not mentioned in any more detail here but have certainly made a significant contribution include Laurie Baker in Kerala whose life’s work follows economical, ecological and sustainable criteria in building and is devoted above all to people in lower income groups. Similar approaches come from architects like Anil Laul, S.K. Das or the “barefoot architects” in Rajasthan who work together with many people employing their craft skills in the construction process and who use only locally available materials. This book presents a varied spectrum of building types and architects with different approaches to illustrate current trends in Indian architecture, with aspects of ecology and sustainability playing an increasingly important part. Planning for New Mumbai Mumbai, formerly Bombay, is the commercial and financial centre of India, with a population of about twelve million at the time of writing. The huge city is growing by many thousand hopeful immigrants from predominantly rural areas each day. Mumbai‘s particular topography – it is a long, narrow peninsula – meant that the constantly needed extension of the city limits was possible in one direction only, northwards. Britain‘s efforts as a colonial power 200 years ago were directed at „citifying“ something that was essentially a withdrawn little town because of its outstanding location as a harbour and trading centre. But Bombay did not start to flourish until 50 years later, when the turmoil of the Civil War cut off American cotton export. So the world focused its interest on Indian cotton, and Bombay became the centre for the shipment of goods. Ultra-fast growth began, the port became the largest in India, and rapid urban expansion created the problem of a housing shortage and a proliferation of emergency accommodation. The centre of Mumbai, now and then, is at the southern end of the peninsula, where commercial life developed and population density and land prices are highest. The extreme expansion of the urban area to one side of a fixed commercial centre created Mumbai‘s major problems of long transport routes. Journeys lasting several hours on express trains had to be accepted if people were to get to work, a state of affairs that eventually reached its natural limits. As early as 1964, Charles Correa with his colleagues Pravina Mehta and Shiresh Patel proposed to the Mumbai city authorities that they should not expand any further northwards, but use an eastern site cut off by a sea bay for urban expansion, with the aim of establishing New Mumbai. The government did not finally accept this plan until 1970, when it started to buy land east of Mumbai old town. Large bridges then made it possible to create a direct link with the old centre, so that there was now nothing else in the way of the actual goal of a new commercial centre with a new urban structure. The City and Industrial Development Corporation (CIDCO) was founded, and Charles Correa headed it as chief architect from 1970 to 1974. Their aim was to settle at least four million people in New Mumbai, thus containing the spread of further emergency accommodation and creating enough new jobs. There were two key aspects to be dealt with: creating living space and setting up mass transport systems. The southern sub-centre called Ulwe, for which Correa produced a development plan, is now part of New Mumbai. The intention was to carry out real town planning here, with the colonial British planning in Old Mumbai definitely providing a model: a development and use plan was drawn up in co-operation with CIDCO, rules were fixed, i.e. the building development structures, building heights and street width etc., and a start made by designing 1000 dwellings for 350,000 inhabitants. Every income group was to be considered here, and cost/use factors devised in categories, for example clay or bamboo buildings for lower income groups, masonry buildings for middle income groups and apartments for high earners. The complexity of a city as an urban organism meant that flexibility had to be a factor as well, with room for natural growth. Urban quality in the sense of an ambience appropriate to human scale meant considering factors like varied living space dependent on urban density, structures like neighbourhoods and quarters, public buildings and areas, also sufficient green areas and open spaces, and transport with adequate stopping points. Correa developed a complex and flexible urban structure for Ulwe, but at the same time laid down strict building guidelines to guard against Indian urban sprawl: urban blocks as the basic structure, with fixed building height, numbers of floors and street and rear façades, and also fixed use dependent on position within the city. An urban centre offered administration, public buildings, green areas and transport links with buses and trains. This ambitious, fixed structure – and thus inimical to the Indian free spirit – has been under construction for several decades. Planning for New Bagalkot New dams caused the Ghataprabha River in the state of Karnataka to rise and flood parts of the old town in Bagalkot. A new centre, New Bagalkot, was proposed and planned to accommodate 100,000 people. Charles Correa was faced with similar problems as in Ulwe, just on a smaller scale, but even greater flexibility was needed for the building development and the street space. Here what were called „planned-unplanned“ elements had to be factored in, as a great deal was to be left to the people themselves. As natural growth was seen to be desirable, it was important to lay down rough urban development guidelines only. These addressed the size of the quarters, linked routes through the town, the transport systems and stopping points, and not least, the building development structure. Correa prescribed a hierarchical geometrical structure that resembles the diagram of the Mandala, the old Hindu symbol of the cosmos. Indian town planning has been linked to the abstract idea of the cosmos for centuries, an idea that Correa takes up here. world axis of the universe. The centre was developed strictly in blocks, grouped around the pool of water in the prescribed geometrical fashion. The design that Correa prescribed for the building development inside the quarters is very dense in the centre and slowly but surely decreasing in density towards the edges of the quarters, with the possibility of breaking up altogether. Only a few dominant street links are laid down, so that connecting routes can emerge by their own accord during the growth period. Different housing types were to meet the needs of all income groups, with relatively high density development packed tightly into the quarter as a whole, was intended to create the typical oriental bazaar atmosphere. This design, which applies metaphysical symbolism to historical models in particular, has also been under construction since 1985. Museum was inspired from city planning of Jaipur. 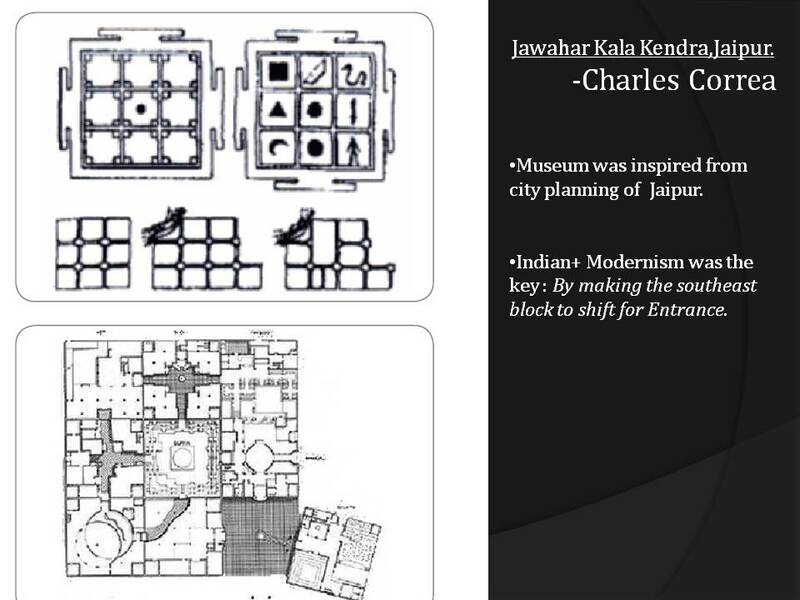 Indian+ Modernism was the key : By making the southeast block to shift for Entrance. Bearing walls made brick . So the temperature shows that the city is hot and humidity shows that its dry. arrangement of spaces as per their time of use. How sun effects the design…? Exposure of east and west façade to the sun. 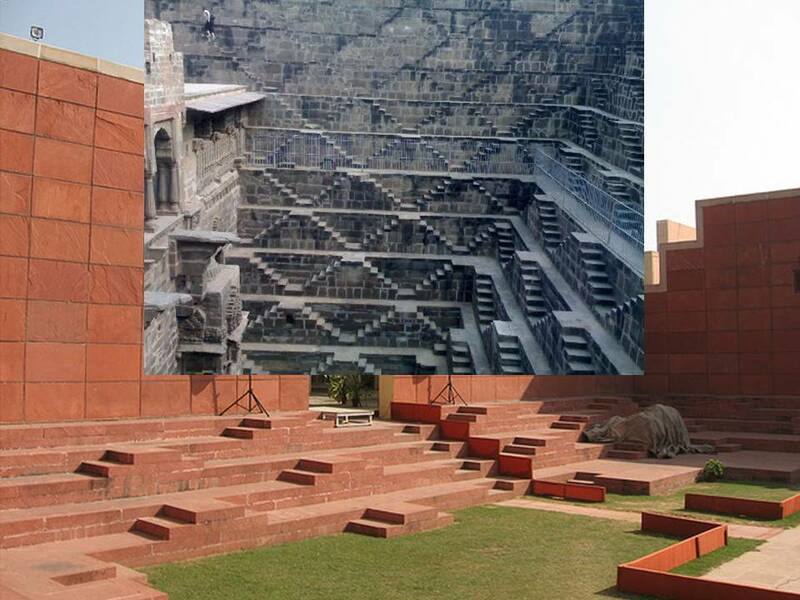 Hence the design came…the three block system..
Over head pargolas-helps in shading the wall during the day time. Recessed or Sunken windows-allows only diffused light into the building. Louvered doors-it also cuts off the heat and direct sun coming from the entrance. STEP PYRAMIDAL form of spaces inversing with respect to the season. Garden space in front of the house. Material chosen-concrete and brick covering. The church can accommodate 2000 people inside the walls and 3000 outside. The form of the church has been derived from tri-partite structure of Coptic and Syrian traditions . However the rituals themselves , with the faithful sitting and kneeling on the floor are completely indigenous. Scheme caters wide range from the lowest budgets of Rs 20000, Middle income groups Rs 30000-50000 and Upper income Rs 180000. Though ratio of costs is 1:5 the variation of plot is much smaller , from 45 to 75 square metres. This office complex of LIC is situated on the outer road of Connaught circle and acts as a pivot between the colonnades of CP and new generation of high rise towers that now surround it . Thus the building is both a proscenium and a backdrop: a 12 storey stage set whose faceted glass surface reflects the buildings and trees around CP. Two lower levels of the complex consists of shopping decks and restaurants while upper level are offices located in two separate wings . A pergola connects the two buildings . A city proposal for an elevated pedestrian walkways if constructed will pass through the two blocks , allowing pedestrians to traverse the building as the great darwaza ie gateway defined by a portico form. Accommodates 300 guests , centers for massages and yoga, water sport etc. The facilities had to be deployed in the manner which would create a critical mass for each activity and at a time open up several strategic points on the site so as to increase future growth options. The master plan there fore does not concentrate all the facilities in one area , but generate a large number of potential growth points, thus allowing a more flexible response to future demands . On the edge of the beach hidden under the palm trees . They are suits for longer stay with cooking facilities etc. overlooking the beach there are 100 guests rooms. Here the facilities are such that every room gets its own private sundeck.. Between these two are private detach ho units . Other pavilion consists of little bamboo chhatries with coir matins on the floor and local Kerala handicrafts.